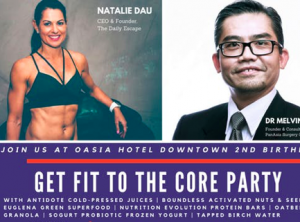 Get Fit to the Core at Oasia Hotel Downtown's 2nd Birthday Party 2018 | JustRunLah! In conjunction with Oasia Hotel Downtown turning 2, we’re being gutsy to throw a fitastic party to celebrate with you! Themed along Oasia’s three wellness pillars – Recharge, Refuel and Refresh, the party is a celebration of a fit and fabulous lifestyle that starts from the core. Join in a morning of activity to start your heart pumping and get your body moving. Recharge with celebrity fitness influencer and popular sports personality Natalie Dau aka @rockstarms who will HIIT you into shape as she begins with a high energy 1 hour session to work your body, abs and booty! Take the challenge as no (healthy) guts no (body) glory! It’s not just the outside but the inside that counts. Dr Melvin Look from PanAsia Surgery Group who specialises in gastrointestinal and digestive issues will talk about the importance of keeping a healthy gut. How it has a profound effect on our general well-being and can prevent diseases and cancers. Refuel with belly nourishing treats and drinks from our like-minded partners who are ab-solutely thrilled to join in the celebration with their latest products to hit town. Sample a range of unique healthy bites and beverages from Finland to Japan to get your gut happy. For post-workout munchies, stomach the chance to try Euglenagreen superfood sourced in Japan, Boundless activated nuts and seeds from London, Nutrition Evolution Australian superfood spices and protein bars, newly launched local brand Oatberry allergy-free granola and Sogurt’s latest probioticfrozen yogurt. Refresh with Tapped birch water made by the forests of Finland and Antidote cold-pressed juices locally tailored to your digestive health. Everyone goes home fitter and happier with a bag of goodies worth over $100 kindly sponsored by our wonderful partners. We have a gut feeling you will have an ab-surd amount of fun with us! Limited tickets available! Sign up before they get gutted out!